Broadwell is the next generation of Intel Core CPUs. It will power most of the laptops and desktops we'll see over the next 18 months, among other kinds of gadget. It's not here yet, but many, many people are eager for its arrival. Including us. Broadwell is Intel's fifth generation of Core-series processor, and will define the sort of power we'll be able to get from our computers of the future. It's pretty important, but what's new? We're going to have a peek into Broadwell to see whether it's worth holding off for, as the first Broadwell computers will start flying of shelves towards the end of the year. Intel upgrades its core processor range every year to 18 months with a new generation of chips. However, it's not a whole new system every time. It follows a 'tick tock' path of upgrades, something the company has used since 2007. But what on Earth does 'tick tock' mean? If one year's upgrade offers a completely new processor architecture, the next will be a shrinking of that processor's layout. Shrinking a processor's architecture makes it more efficient, if perhaps not always radically more powerful. Intel Haswell was a 'tock' upgrade – a new architecture. Intel Broadwell is a 'tick', and sees Haswell shrink down, make it that bit more streamline. So, how much smaller will Broadwell be? The architecture shrinking process isn't about getting the actual chips smaller, but the transistors that make up the CPU's brain. Intel Haswell uses 22 nanometer transistors, Broadwell's transistors will be 14nm. Back in 2006, the first Core processors had whopping great big 65nm ones. We've made a lot of progress in those eight years. If you're wondering how big a nanometer is, a normal human hair is about 90,000 nanometers thick. These transistors are incredibly tiny, even the old ones. They are the switches that work together to perform the incredibly complex functions a processor has to deal with, and there are more than a billion of them in a modern CPU. 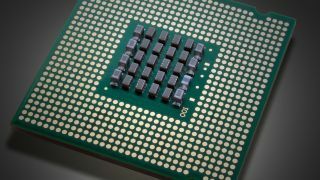 The big claim about Broadwell is that its chips will be 30% more efficient than Haswell's ones, using 30% less power while providing slightly better performance at the same clock speed. Everyone's a winner. Haswell already made huge improvements to efficiency compared with the previous generation, Ivy Bridge, resulting in a huge upsurge in the battery life of Windows laptops last year. Looking at what Haswell did when it arrived in 2013 tells us what we can expect in Broadwell. For an example, the 2012 13-inch MacBook Air was rated by Apple for seven hours of battery life when web browsing. It used the Ivy Bridge generation of Intel chip, one step behind the current Haswell models. Today's Haswell 13-inch MacBook Airs last up to 12 hours. That's an extra five hours of stamina, and a lot of that was down to Haswell. With the upgrades of Broadwell in tow, we could be looking at laptops that last for more than 15 hours. Finally, we'll have laptops that can outlast current tablets. Pure battery life is not the most important part of why Broadwell really matters, though. Having better efficiency will enable a laptop screen revolution. In the last few years, laptops have lagged way behind phones and tablets in terms of screen technology. If you have a good phone and a mid-range laptop, there's a good chance your phone's screen will have more pixels than your laptop's. It's a bit mad when you stop and think about it. Greater efficiency will allow laptops without giant batteries to use higher-res screens without a deal-breaking battery life hit. We won't see ultra-high res £300 laptops just yet, but this is the first step to affordable laptops whose screens aren't as blocky as Minecraft.